Raju was quite a character with strong views and a bit of an autocrat, though well-meaning, as far as running the Indian Liberal Group and Freedom First. He was a great story teller and to hear him talk about the history of Rajaji, Masani and the Swatantra Party was always a great pleasure. What I found fascinating about Raju was how dedicated he remained till the very end about making sure that the various activities that he was managing were done in a regular and timely manner. His dedication and persistence should remain an inspiration for all of us looking to build a better India. Raju was an inspiration and a mentor in the early part of my career. I will always remember him as an intellectual with unflinching integrity, resolute in his fight to uphold liberal values, always ready with sound advice and a helping hand whenever needed. Am sure Raju has left behind many admirers. I knew Raju from the days I was a student of the Department of Civics and Politics, University of Bombay. Reading his views in Freedom First (whether one agreed with him or not) was always educative and I have learnt a lot from him. He was a great editor; greater still he was a fine man and friend. We shall all miss him tremendously. I first came into contact with Sri S. V. Raju through late Prof. A. B. Shah and Sri Hamid Dalwai both great rationalists and true secularists. Sri Raju’s interests were varied – all in the propagation and promotion of the right ideas about rationalism, liberalism, secularism and true welfare. He imbibed from Minoo Masani, sense of time and discipline and decency of behaviour. He put in immense labour to see that the journal Freedom First continued to be published despite financial constraints. His commitment to liberalism, freedom and liberty appealed many who supported the journal in its difficult times. 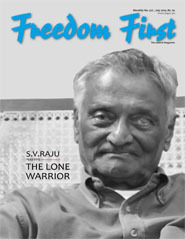 Though I have been a life subscriber to Freedom First for more than two decades, I met Mr. Raju for the first time in 2010. Our college was organizing two seminars and I approached him for academic collaboration of Freedom First with our college. I cannot forget his enthusiasm and willingness as he arranged for some excellent guest speakers. I discovered in him an intellectual par excellence, a liberal mentor and guide who was firm but understanding in his advice and discussions on various issues. Each of my visits to his office thrust on me a magnetic pull to meet him again. Visits would be short, but pleasant and gratifying. What I found most appealing about him was his respect for individual viewpoints and contentions. He had the charm to win the hearts of the young and encouraged our students and teachers to write for Freedom First. Raju spoke earnestly without pretensions and that was his asset. Raju, as we all fondly addressed him, was a pillar of the Liberal movement. He kept the flame of the Indian Liberal movement alive through the Indian Liberal Group and oversaw its transformation into LiberalsIndia for Good Governance. We are indebted to him for his guidance and unstinting support in the formation of this non-profit organization. His wise counsel at all our meetings and active participation in spite of his frail health and other commitments was a source of inspiration to us all. We wondered at his perseverance when at the last Board Meeting held a month before his untimely demise, he walked all the way from his office at Kala Ghoda to Wodehouse Road, a distance of about two kilometres! Raju was truly a one of a kind Liberal, who dedicated his entire adult life in the service of the Liberal cause, without expecting any personal reward, whatsoever. His breadth and depth of knowledge were as remarkable as his deep humility. He was the true successor to Rajaji and Masani, whose legacy he nurtured, and whose memories he kept alive through the fond anecdotes that he shared often. He handled his responsibilities in a business-like, efficient, forthright, open, and cordial manner. We will miss him deeply - he has left a void that will be hard to fill. Masani was flamboyant, Ranga one dimensional, and Rajaji often cranky. But Raju was the patient, hardworking backbone of the idea of Swatantra. People came and went. It was he who single-handedly kept the flame alive. A hundred years from now, when future historians assess and re-assess the quality of Freedom First’s editorials under Raju, is when we will fully understand the man’s importance in India’s history. © Copyright Freedom First. All rights reserved.